Thousands of Hoosiers have been impacted by the partial government shutdown that began 24 days ago whether they&#39;re a federal employee or not. 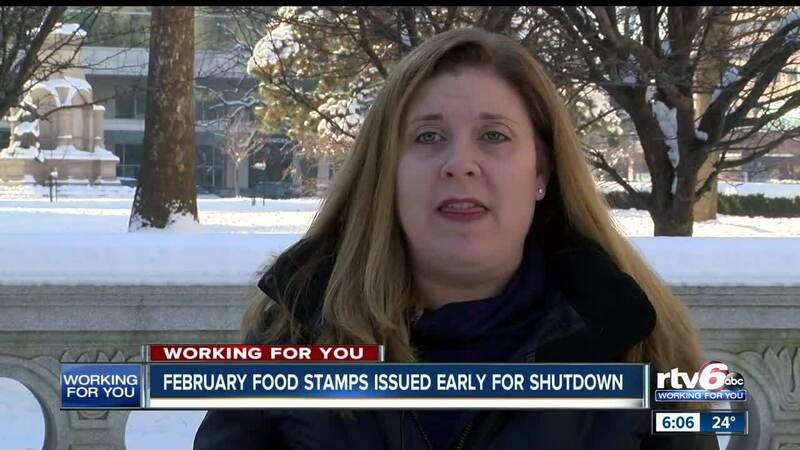 INDIANAPOLIS — Nearly 600,000 people on food stamps in Indiana do not have to worry about eating next month. The Family Social Services Administration has decided to issue February food stamps early because of the government shutdown. Whether they're a federal employee or not, thousands of Hoosiers have been impacted by the partial government shutdown that began 24 days ago. People like Brookelynne Thompson — who rely on food stamps to feed their families, have been unsure of what's happening to them since the program will run out come February. "It's definitely confusing and it's like you have to keep up today with the news and try to figure out what is actually going on and what they're telling us," said Thompson. But the United States Department of Agriculture, also known as USDA, announced today they're going to issue next month's food stamps early, meaning recipients will receive their benefits on Wednesday. Thompson said the early release will cause some confusion for the month of February. "It's going to cause some hardship..." Thompson said. Some people don't get food stamps until almost the end of January, so that's going to hurt them at the end of February. Typically, people would receive their food stamps alphabetically over a 19 day period throughout the month. Now they will not receive any in February. The USDA says this is the only way they were able to guarantee people their benefits. "We fully expect that benefits will not last people who are receiving them for that duration," said 'Feeding Indiana's Hungry' executive director, Emily Weikert Bryant. "We expect retailers will probably be pretty swamped. And we fully expect that food banks and food pantries will be hit really hard after that." People say they're going to adapt the best they can and budget for next month. And rely on food banks when necessary. "There's a lot of people that would go hungry if it wasn't for churches and soup kitchens and all that," said Miranda Hillenburg. "People would starve with their kids." Hillenburg is a client at Interchurch Food Pantry of John County. "At this point, we don't know what's going to happen in March," she said. "We hope the shutdown is over by then. We hope that these problems will be resolved." If you utilize food stamps, or need other assistance, call 211 and they can direct you to any resource.